, the only FDA Approved Ingredient for Real Hair Regrowth for women. 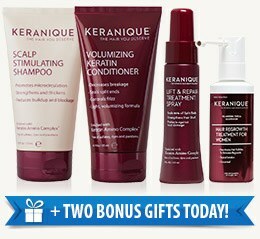 What products are in the Keranique® Hair Regrowth System? Keranique Daily Essentials contains Biotin, and is formulated to support the Keranique Hair Regrowth System to help grow thicker fuller hair. These ingredients help maintain healthy hair follicles.